Michele E. Benson, chief development officer with the Virginia Peninsula Foodbank, has attained her Certified Fund Raising Executive (CFRE) certification. CFRE International is an independent nonprofit organization dedicated to setting standards in philanthropy through a valid and reliable certification process for fundraising professionals. In 2013, the CFRE credential became available worldwide as the global standard for the fundraising profession. Benson has been with the Virginia Peninsula Foodbank since 2011. Hip Innovative Studio Boutique, has located at 141 Walt Whitman Avenue in Port Warwick. The boutique features owner and jewelry designer Anna Hubbard’s one-of-a-kind collection, created on site as well as other handcrafted jewelry and accessories from select artisans. The staff includes instructors offering workshops in jewelry design that incorporates brass, copper and sterling silver metalsmith techniques. 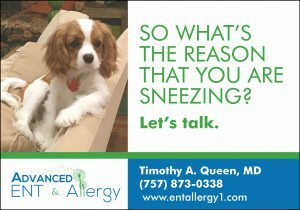 Phone number is 757-223-8799. Langley Federal Credit Union has been ranked Best Credit Union in the nation by Kiplinger’s Personal Finance’s first-ever rankings of the Best Banks in the U.S. Langley was also ranked second for the 2017 Best Bank for Millennials. To identify the best of the best, the magazine made their selections among national banks, nationally available credit unions and Internet banks, plus the best bank in each of four regions, as well as the top and runner-up institutions in a number of personalized categories. Tom Ryan is Langley’s president/CEO. Michael B. Mendelsohn, CPA, MAcc, has joined PBMares’ Newport News office as a partner in the area of taxation. With more than 13 years of public accounting experience and three years of corporate tax experience, Mendelsohn specializes in tax planning and compliance for closely held companies, working with high net worth individuals who hold complex or alternative investment portfolios. 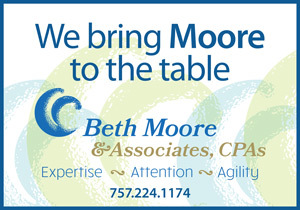 Prior to joining PBMares, he was a partner at another local CPA firm and previously a senior manager at a top 20 firm. Mendelsohn earned a Master of Accounting degree from The College of William & Mary. 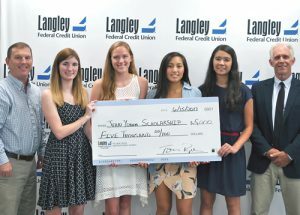 Langley Federal Credit Union (LFCU) presented four deserving young members with the Jean M. Yokum $5,000 College Scholarship award for academic achievement. The recipients were Alyssa Costello, Corbin Hawk, Christine Kemmerly and Christine Siu. The four recipients were selected from 92 applicants competing for the award this year. Costello graduated from York High School and plans to attend the College of William & Mary, where she will study pre-med. Hawk graduated from Menchville High School and plans to pursue a career in engineering at Virginia Tech. Kemmerly graduated from Maggie L. Walker Governor’s School and will attend Miami University, Oxford, Ohio, where she plans to pursue a degree in zoology. Siu graduated from Poquoson High School and will attend the University of Virginia, where she plans to pursue a degree in chemistry and pre-med. The Jean M. Yokum College Scholarships are awarded to successful applicants who are members of Langley’s Constellation Club, which is designed for youth through the age of 18 and provides a tool for parents to teach their children the importance of financial responsibility. Shown here are (left to right) Tom Ryan, Langley president/CEO; Hawk, Kemmerly, Costello, Siu and R. Lester Wingrove, Jr., Langley board chairman. 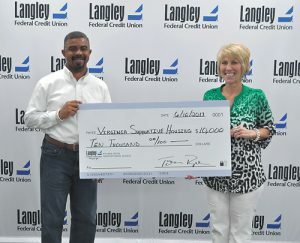 LFCU donated $10,000 to Virginia Supportive Housing to provide supportive services to help clients remain stably housed. These services include primary healthcare, helping to secure income, case management and counseling, skills building, substance abuse and more. Shown here are Gary Hunter, Langley AVP of corporate relations and Arden Reed, Virginia Supportive Housing major gifts officer. 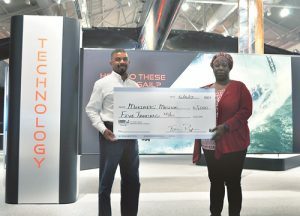 LFCU donated $5,000 to Mariners’ Museum. The funds will be used to update the Age of Exploration program. The program is one of the Museum’s most requested and will align with the new social studies standards of learning that officially become effective in Fall 2018. Shown here with Hunter is Wisteria Perry, Mariners’ Museum manager of student programs. Julia Bowditch has been named annual giving officer with Riverside Health System Foundation. Her focus areas include its annual team member giving campaign, grateful patients and its cancer campaign. A graduate of East Carolina University, with a Bachelor of Science degree in communications, public relations and journalism, Bowditch previously worked with the American Cancer Society and Habitat For Humanity of the Peninsula and Greater Williamsburg. Lori Marrow, mortgage industry veteran, has joined Primary Residential Mortgage, Inc. (PRMI) as branch manager of its newest office branch, located at 742 Thimble Shoals Boulevard, Suite A, Newport News. Marrow has more than 30 years of experience in the mortgage industry and is responsible for the overall management of the branch, recruitment and assisting individuals with their home loan needs. She was previously a mortgage loan consultant with Wells Fargo Home Mortgage. Virginia Living Museum is featuring the award-winning Nature Connects: Art with LEGO Bricks exhibit through November 26. The exhibit is located throughout the museum’s Conservation Garden as well as other outdoor areas. The exhibit, made possible by its presenting sponsor, EVB, features, in addition to the Monarch butterfly, 16 other giant sculptures of nature. Artist Sean Kenney, the creator, uses LEGO toys as a medium for contemporary sculpture. His work has been featured in The New York Times and The Wall Street Journal, and he has created pieces for television shows, celebrities, tourist attractions and Fortune 500 companies around the world. Sonia Alcantara-Antoine has been named director of libraries and information services for the City of Newport News. She brings more than 10 years of experience in library management, educational programming and community services. She was formerly public services manager for the library system of Virginia Beach. Previously, she worked for the Enoch Pratt Free Library in Baltimore, serving in various capacities, including state resources center manager and library supervisor II. Alcantara-Antoine holds a master’s degree in library science from Florida State University and is working toward a second master’s degree in public administration from Old Dominion University. She replaces former director Izabela Cieszynski, who retired earlier this year after 34 years of service. The Hampton Roads Association for Commercial Real Estate (HRACRE) will host a Mix & Mingle on September 28 at Topgolf, Virginia Beach. To register, contact Gia gi-gi Freeman, office manager, at 757-481-2494, or sign up for the event at www.hracre.org. September events scheduled by the Virginia Peninsula Chamber of Commerce include Coffee Connection, September 12; Business Education Seminar, September 12; Pink Bag Lunch, September 14; Peninsula Chamber Senior Advocate Roundtable (PCSAR), September 20; Business Education Seminar, September 26; Bridge (Young Professionals) Luncheon, September 28; and Business Connection After Hours, September 28. For registration and additional information, go to www.virginiapeninsulachamber.com/events/calendar/2017-09-01. The top agents for July for CENTURY 21 Nachman Realty’s Peninsula Office were Chris Pray, top listing agent and top selling agent; Melanie Whitehead, top closing agent; Carla Stokes, top producing agent and Jamie Coldsnow, top referral agent. University of Virginia Health System (UVA) and the Bon Secours Liver Institute of Virginia will collaboratively care for patients at Bon Secours’ facilities in Richmond and Newport News who may need liver transplants at UVA. The Bon Secours facilities include St. Mary’s Hospital in Richmond and Bon Secours Mary Immaculate Hospital in Newport News. Under the affiliation agreement, care teams from Bon Secours and UVA will co-manage patients at the Bon Secours Liver Institute of Virginia with liver disease, including those with advanced cirrhosis and liver cancer, who will be evaluated for a liver transplant. 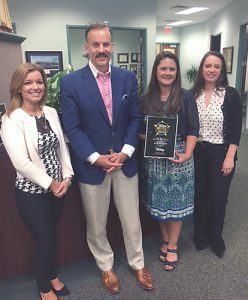 Point Comfort Wealth Management has been selected as an Overall Gold Winner of Coastal Virginia magazine’s Best Of Reader’s Choice Awards for the “Best Financial Planning Company” category. Point Comfort Wealth Management has locations in Oyster Point and in Williamsburg. Securities and advisory serviced are offered through LPL Financial, a registered investment advisor, member FINRA/SIPC. Pictured (left to right) are Point Comfort Wealth Management members Samantha Guthrie; Steve Sigmon, partner; Jennifer Daknis, partner; and and Ashley Gorse. The Peninsula Chapter of the Christopher Newport University (CNU) Alumni Society will hold its 7th Annual Captain’s Choice Classic Golf Tournament at the James River Country Club on Friday, November 3. 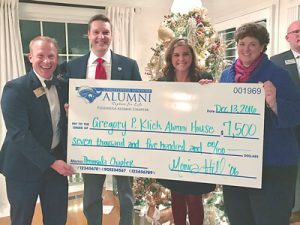 Over the last six years, the tournament has raised more than $50,000 for initiatives supporting local and alumni communities, including an endowed scholarship fund for in-need CNU students native to the Virginia Peninsula, Fear 2 Freedom and the Christopher Newport Alumni House. The chapter has fully funded its first endowed scholarship with the proceeds from this tournament and will begin to award the scholarship during the 2017–18 academic year. Shown here (left to right) are Baxter Vendrick, Jr., CNU director of alumni relations; Eric Kean, co-chair of the Captains Choice Classic; Monica Hill, CNU assistant director of alumni relations; and Muriel Millar, co-chair of the Captains Choice Classic, presenting proceeds from its last six tournaments to support the Gregory P. Klich Alumni House. Recent promotions at Malvin Riggins & Company include Kimberly Calhoun, CPA, and Megan Nester, MST, promoted to senior managers; Victoria Meekins and Caitlin Messina, CPA, promoted to senior associates; and Meghan Doyle, promoted to associate. The 2017 Peninsula Walk to End Alzheimer’s is scheduled for Saturday, October 7. The opening ceremony will take place at the Christopher Newport University (CNU) Alumni House, at 72 Shoe Lane, and the walk course will take participants through the CNU campus.